I went on a buffet with my family and guess what? I ate 3 prawns and half a dozen of raw oysters. I was ok. Shocking right? But on another occasion, I took a few pieces of homemade french fries and I flared up for a week. My front of the elbows, my legs and back of my knees are still red and itchy. I have been eating my sulphur pills for the past one week but I am not sure whether it is helping. Another factor could also be because I have been putting Lemongrass essential oil on my clothing (to ward off mosquitoes) and I guess I am sensitive to it. 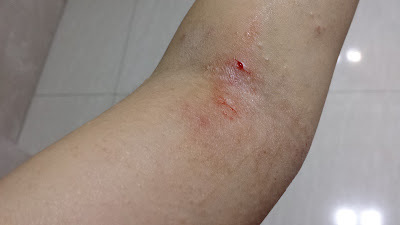 When the oil rubbed against my skin, it became very itchy and red. There is also one time, my grandma cooked duck soup and I itched really bad that night. I scratched till I bleed and I didn't even realised that. Generally, I am still doing fine. Currently going through my divorce and hopefully we can settle things amicably. I am really quite tired almost everyday, settling the kids to bed, managing the maid and also doing all the groceries and toiletries and diaper shopping on my own if I am not doing OT at work.